Torrential rain for days has followed on from near constant rainfall these past weeks and months. But, since Christmas Day afternoon the rain has been incessant, unrelenting and prolific. It has resulted in chaos throughout Lancashire and Yorkshire – the citizens of Cumbria will be relieved as it was forecast to hit them instead and, with the floods they suffered just weeks ago, they were braced for further damage to homes and businesses. Instead, it missed them and caused mayhem closer to my home. Just a few miles down the valley, the towns of Hebden Bridge, Sowerby Bridge and Todmorden were hit as the rivers and canals burst their banks flooding the towns. 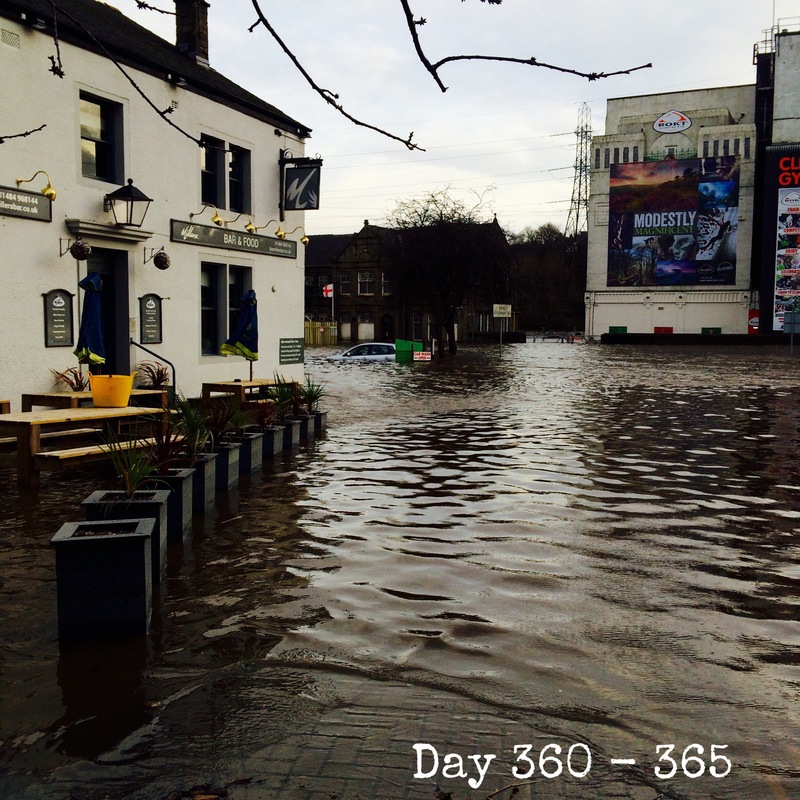 My own town of Brighouse didn’t escape either; the River Calder becoming a torrent that proved unstoppable. It overtopped its banks in many places and, in the canal basin, the locks are submerged and footpaths and towpaths under water. Thankfully, when Sarah and I walked out with the dogs to witness the scenes for ourselves, Artisan, one of my most longest client and owned by two lovely people, hadn’t yet been hit as they had been just weeks ago. They are not yet over the problems caused by that flood and I feared greatly for them as this most recent one was poised to cause damage. Walking further into town, the power of the water and the the devastation it causes was evident in man places. Here, roads and car parks are submerged and a car is stranded, presumably a write off, amidst the waters.